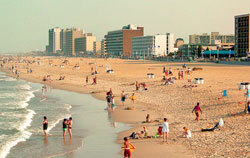 All 160 rooms at the Courtyard by Marriott Virginia Beach Oceanfront North have an oceanfront view with balcony. The rooms also have 2 phone lines, data-ports, refrigerator, coffee maker, work desk, cable TV and Nintendo. Free high speed internet access. Guest laundry facilities. Free valet parking. The Courtyard Oceanfront North Hotel's big tropical-style outdoor and year-round indoor pools are a nice change of pace from the beach. There's also a fitness center and meeting rooms are available for groups. It's easy to see why this is one of Virginia Beach's most popular hotels. The oceanfront dining room has a panoramic view of the beach and boardwalk. It serves breakfast, lunch and dinner. Room service is available too. 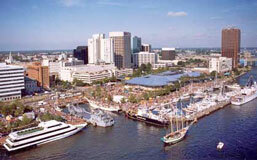 The Courtyard Marriott Oceanfront North Hotel is located in Virginia Beach, Virginia at 3737 Atlantic Avenue. Map. It's right on the boardwalk, toward the quieter northern end of the beach.